Spent half a day trying to figure out Mailman mailing list under Virtualmin (control panel) and Centos 6.4 Apache server. Problem one was turns out the Godaddy VPS Centos 6.4 repository (the one Godaddy recommends) I’m using has not updated the mailman script for YEARS. The Godaddy VPS server this domain is running on was running Mailman v2.1.12 from I think 2009 when Mailman v2.1.18 from May 2014 was available. I didn’t NEED to upgrade per se (Mailman 2.1.12 works), but since old software tends to have more security vulnerabilities and less features than new versions, I always upgrade when I can. Life is very easy with a server when you can type “yum update” in something like Putty (or in a control panel like Virtualmin click Update) and everything on the server updates like magic. This relies on the repository your server uses having staff who regularly compile the latest versions of server scripts etc… and package them for the operating systems they support. Apparently Godaddy VPS servers or Virtualmin or even Centos 6.4 (not sure which: think Virtualmin since it’s bundled with Virtualmin so should be updated by Virtualmin?) hasn’t bothered checking Mailman for updates, or at least not this decade! For the most part, upgrading Mailman entails installing the latest version over the existing version. Usually, you can unpack the new release, run ‘configure’ with the same options you used in your previous install, and then do a ‘make install’. 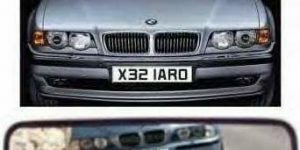 However, there are some changes that may need to be taken care of manually. Took a while to figure out the actual steps. Using something like Putty gain SSH access to the server. Note: Nothing is changed to your current version of Mailman until you run the last command “make install”. Why the above basic Mailman update tutorial steps aren’t easy to find is beyond me, this is what each line does. Followed by the command CD root. Could do this in any folder really. Step 1 : wget (go get) the archived latest Mailmain script from http://ftp.gnu.org/gnu/mailman/mailman-2.1.18-1.tgz. You should check http://ftp.gnu.org/gnu/mailman/ to find what is the latest tgz file and change if not mailman-2.1.18-1.tgz. Step 2: Unzip (untar) the file you just uploaded to your server. Server experts seem to forget WE either don’t know where the latest file is and how to get it on the server using wget. They tend to jump into step 4 below assuming we know how to find the relevant update file, upload it to the server (step 1) and unzip it (step 2). 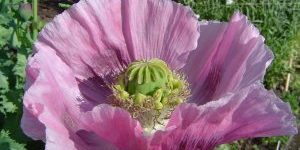 For the server experts out there, when writing software tutorials remember there’s a lot of people who would like to use your software that don’t know about these basic tools and techniques. If you add a few extra lines of steps to take you ca make our lives so much easier. 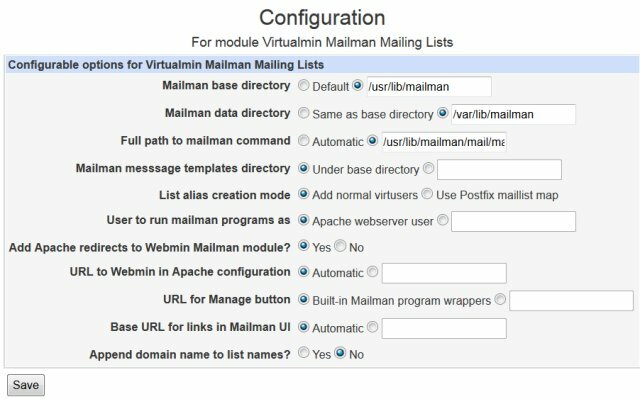 Step 4: Now we configure Mailmain, here’s where it got tricky as I didn’t know what settings Virtualmin/Webmin module used when Mailman was first installed. After a little research and getting it wrong a few times figured out what options to set. ––prefix=/usr/lib/mailman is where Virtualmin installed Mailman main files. ––with-var-prefix=/var/lib/mailman is where Virtualmin installed the Mailman data files (I think). ––with-cgi-gid=apache is the user Virtualmin set Mailman to use. ––with-mail-gid=nobody had to add this after getting an error when posting messages to the list. Ran step 4 half a dozen times before it worked correctly, each time figuring out something I’d missed/got wrong like the last line above was added to my last attempt which seems to be working correctly! The above and more options are within the mailman-install.txt file in the unzipped tgz file under /docs/. By default Windows doesn’t have built in support for unzipping tgz files, you don’t need to even download this file to your PC, but if you do and want to extract it to get access to the documentation within I use 7-ZIP (it’s free) as it covers loads of archive types. 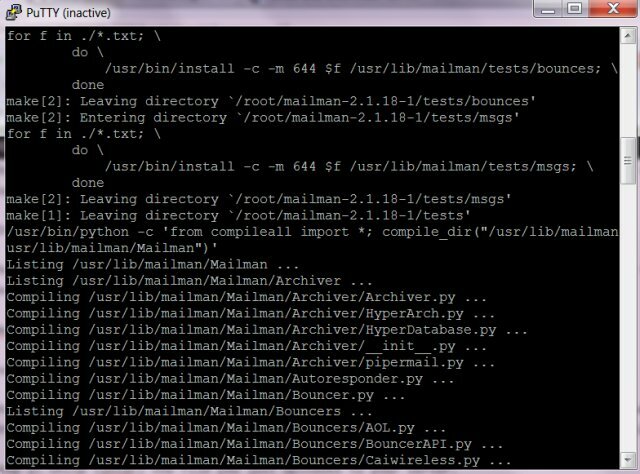 Here’s all the options from the mailman-install.txt file, I don’t know what they all do, been using Mailman about a day. The following options allow you to customize your Mailman installation. set up as described in 2.2.
installation directory for architecture dependent binaries. $prefix directory is owned by this user. $prefix directory is group-owned by this group. value is the list mailman, other, mail, and daemon. to find the right value for this switch. value is the the list www, www-data, and nobody. Mailman CGI scripts will run if this is incorrect. Specify the fully qualified host name part for outgoing email. If you don’t run Virtualmin/Webmin the locations and options you need for step 4 will probably be different. Not sure how you find which options were originally used to create Mailman? Seems to be important to replicate those options when you upgrade otherwise your mailman mailing list might throw out errors (mine did before adding ––with-cgi-gid=apache and ––with-mail-gid=nobody). For Virtualmin users if you find your way to the Virtualmin Mailman module under “Webmin >> Servers >> Virtualmin Mailman Mailing Lists : Module Config” the above directory structures are under. Tried without ––with-cgi-gid=apache at first which after step 6 threw out an error when loading a mailing list after the update. providing the command line option `––with-cgi-gid=apache’. I followed the suggestion to go through the configure part again with this included ––with-cgi-gid=apache (which I did and it worked). Basically started from step 4 with different configure options. The error messages Mailman generates are useful, without them wouldn’t have got it working. Step 5 makes the files etc… that will be used to upgrade Mailman. Step 6 uses the files we made in step 5 to upgrade Mailman with the latest files. Few issues as I upgraded Mailman due to Mailman 2.1.12 is about 5 years out of date, so the latest version of Mailman required different features active on the server.. I didn’t have DNS Python installed and it’s a Mailman 2.1.18-1 requirement, so had to install it as well. Changed directory to root as before with “CD /” and “CD root” before running these 4 commands. Like before check https://pypi.python.org/packages/source/d/dnspython/ to make sure dnspython-1.11.1.zip is the latest version. This seems to a be a development addon for whatever version of Python your server runs on. Note added -devel after python from the version of Python I’d found earlier. So if your version of Python is “python-12345” the devel version is “python-devel-12345” in the yum command. If the devel version wasn’t in my server repository would have to use the wget option after finding where “python-devel-2.6.6-37.el6_4.x86_64” is online. Had lot of fun updating Mailman manually, hopefully others will find my laymans guide to upgrading Mailman saves them hours of research and guess work. The page you saved contains suspicious HTML that could potentially expose your users to cross-site scripting attacks. This change has therefore been rejected. If you still want to make these changes, you must have shell access to your Mailman server. Guess it’s uploading files direct to the server to fix this! Also couldn’t find any usable Mailman HTML Templates online, the default output is OLD 1990s sort of HTML output and needs a serious update. I plan to make my mailing list look similar to the page you are on now minus the sidebars, pretty easy to do if I could add anything to the Mailman HTML template system. Your post saved me pain and suffering.